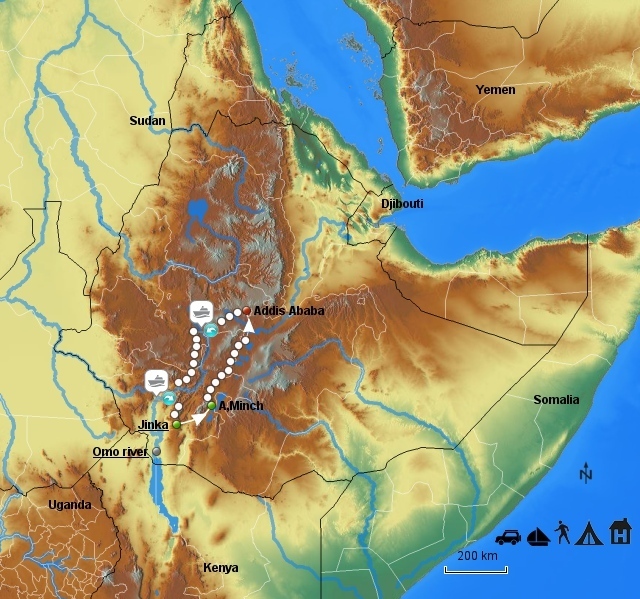 The Omo River , 760 km long , is a very popular river in southern Ethiopia . It takes you to the heart of one of the most remote areas of the African continent. The body of the river starts in the highlands Shewan and moves south to empty into Lake Turkana on the border with Kenya. From 3 120 €. Price subject to a minimum number of participants. The Omo River moves through the dense forest areas , ideal for lovers of rafting or mingle difficult streams and exquisite golf exotic wild life and forest green . This electrifying adventure immerses you in a wild and wonderful world of an almost prehistoric world where you will meet some of the most remarkable in the world tribals. You drift to the gorges of the Omo River in a series of spectacular canyons, “crash” through dense fast and serene pools where crocodiles basking on the banks and or baboons are watching with curiosity the cliffs . The wildlife is prolific troops of monkeys, colorful birds of prey and the rhythm of the ubiquitous sounds of hippos. You can also relax on the and swim in the hot springs in the light of the moon.